This is PART I of a two-part workshop. Each workshop is a stand-alone experience and does not require that you attend the other. However, if you do wish to take both, you receive a 15% discount on the second workshop (and the order doesn’t matter). This workshop offers you very specific research based skills to improve your relationship. The research has been conducted by John Gottman, author or many books on relationships, including, The Seven Principles for Making Marriage Work. In this two-part lesbian couples workshop, I will address 12 skills. We will cover six specific relationship skills in each of the separate one-day-workshops. Part of Dr. Gottman’s claim to fame is that he can predict a relationship’s demise by whether or not couples engage in certain behaviors. How do we make our relationship a place that feels good to both of us? What is the single most powerful change we can make to encourage a greater feeling of connection and mutual understanding? How can we approach tough issues so that we are likely to hear and respect each other’s point of view? What is the number one behavior that leads to a relationship breakup, and how can we protect ourselves from this? If we feel like we are constantly being criticized by each other, how can we break that cycle and create greater understanding and a more positive outcome? What is the number one way to eliminate defensiveness from our relationship? This is a common question/concern for couples. However, it is up to each couple what and how much you decide to share. This is not a therapy group, as much as it is a relationship skill-building class. This is a content-heavy class, with a strong emphasis on research-based information that will be used to improve your relationship skills. There will be a lot of information to digest. We will not be processing individual couple’s issues, however, we will be discussing common experiences, frustrations and concerns that the new skills can help address. Over the years I have learned that my workshops offer people a chance to make new couple friends, and I work to support your continued contact. I have also learned that if you do not put this information to use, you will not maximize your benefit. Toward that end, I provide the following two options for you once the workshop ends. Connect with New Couple Friends: A hidden benefit of these workshops is the opportunity to connect with other couples. Toward that end, you will be invited to join a groupme text group with your fellow classmates, and communicate with them after class ends. Email Reminders with Class Content and Exercises: I am planning to create a series of follow-up emails to give you reminders each week for six weeks following the workshop. These emails will offer you a reminder about the suggested activities for you to practice once you leave the training. You will also be provided with handouts. Lesbian Couples Workshop – From Conflict to Connection (Part I). If you find this experience helpful, there is a part two to this workshop, and because you have enrolled in this one, you receive a 15% discount on the next one, should you decide to participate. 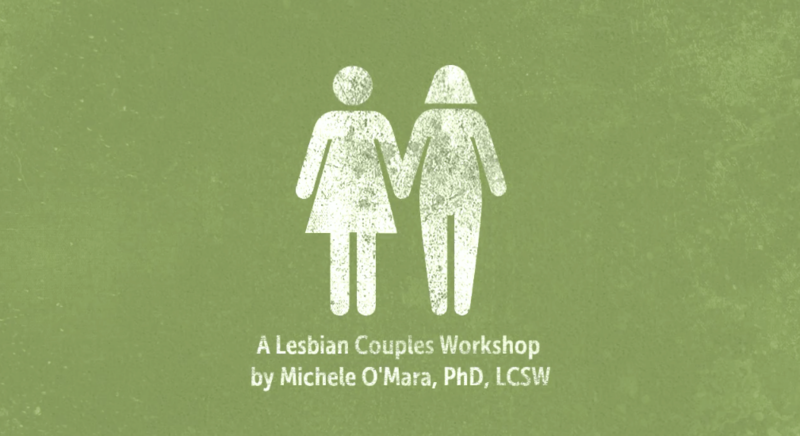 The Lesbian Couples Workshop will introduce you to six specific skills that help you prevent conflict, as well as increase connection. Create a positive relationship environment. Interrupt unproductive conflicts with this new behavior. Start all tough conversations so you are guaranteed a better outcome. Recognize and change the number one behavior that leads to a breakup. Transform criticism into greater understanding and compassion. Redirect defensiveness into powerful insights and new responses. Once you make payment, I will contact you with details about the WORKSHOP, “Lesbian Couples Workshop: From Conflict to Connection” Be sure you check your email associated with your Paypal Account, or email me if you would like me to contact you at a different email. If you cancel within 15 days of the workshop your payment will be refunded. If you cancel within less than 15 days of the workshop the deposit will not be refunded unless there is an unforeseen emergency such as death or illness. Break-ups are not considered an unforeseen emergency – you can attend even if you have broken up. In fact, I recommend it! While I have completed all three levels of the Gottman Clinical Training, I have not pursued Gottman certification, as I more closely align with the principles of Imago therapy. Thus, I am Gottman educated and Imago certified. Both schools of thought are valuable resources for couples wishing to depend their connection, and strengthen their relationship. As with most of my workshops, I have tailored this workshop to lesbian relationships, as that has been my area of speciality for the past two decades. Therefore, this workshop is not an Art & Science of Love workshop by Gottman, nor is it a Getting the Love You Want workshop by Harville Hendrix. This is a workshop designed specifically by me, based on my work with lesbian couples, emphasizing how to apply the research gathered by Dr. John Gottman.